Of the nearly 2 million visitors to Costa Rica each year, just a tiny percentage of them plan a trip to the Osa Peninsula. 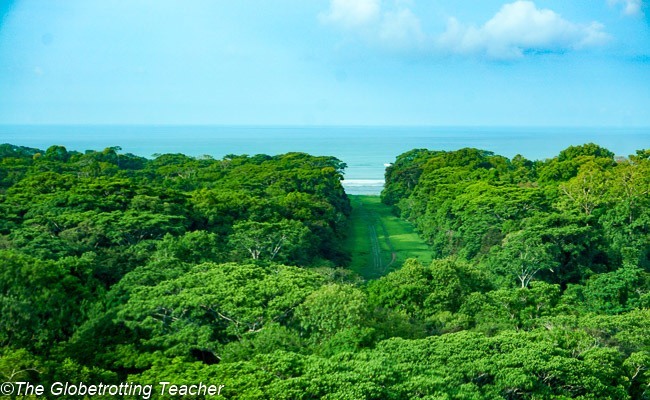 Costa Rica may have hit its tourism sweet spot, but the Osa is still untamed and remote. This is not the part of Costa Rica where the sloths lead the other animals in singing a verse of In the Jungle. The Osa Peninsula is a place of wild, joyful, freedom. Leafcutter ants march relentlessly in long lines across the jungle. 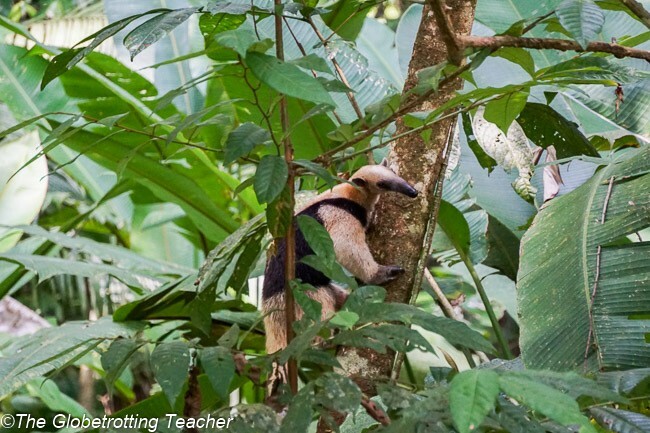 Groups of coatis forage along the forest floor without worrying about a human like me standing in their midst. 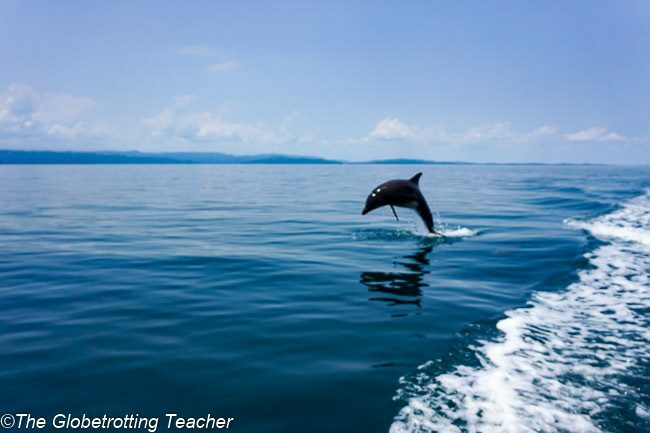 The dolphins in the Golfo Dulce leap from the water playfully. While the spider monkeys shake the branches overhead reminding anyone passing by that we’re in their jungle, not the other way around. First-time visitors might be hesitant to journey down to this pristine southwestern corner of Costa Rica. After all, it’s so much easier to plan a trip to more traversed areas like Arenal or Monteverde. But, consider this. The Osa Peninsula is your best bet if you’re hoping for a Costa Rica experience away from nature experiences whitewashed for tourists. Most travelers fly into Costa Rica’s international airport in San Jose. The Osa Peninsula is 5-6 hours by car depending on your final destination. Until you’re within perhaps a few miles of your lodging, the roads are newly paved and well-marked. Gone are the days when this trip took 10 hours along hardly passable roads! But, expect tolls along the route that are payable in US dollars and/or CR Colons. For extensive driving around the Osa Peninsula during your stay, you’ll want to rent a 4×4 vehicle. The local roads are unpaved and may require water crossings when rivers swell in the rainy season. 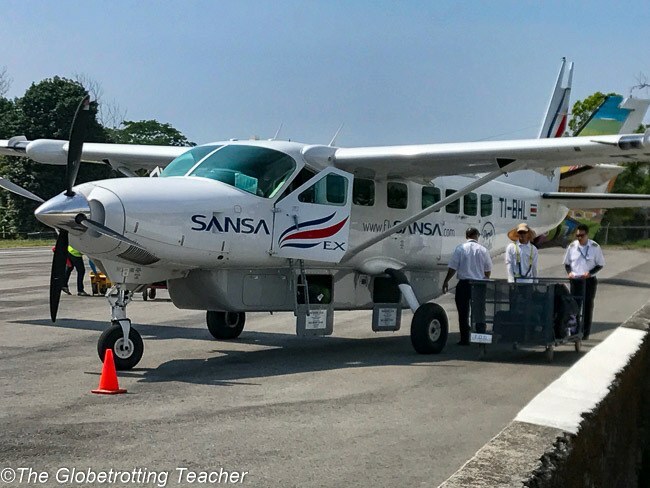 Regional air carriers, Sansa and Nature Air both fly routes between San Jose and the Osa airport in Puerto Jimenez, a popular base on the Osa Peninsula. The short flights take about an hour and cost between $100-$150 one-way. On both my visits to Costa Rica, I’ve rented a car from San Jose and used it to travel around. At the end of these trips, I chose a one-way flight back to San Jose. I had the most time possible to enjoy Costa Rica while expediting my travel time to catch my return flight to the U.S.
One word of caution regarding your initial arrival into San Jose at the start of your trip. On my most recent visit, the airport was extremely busy with numerous flights arriving around the same time. As a result, my plane landed late and I had a 2-hour wait in line at Costa Rican Customs and Border Control. This was not at all the case on my first trip years ago. I also spoke with other return visitors in line with me who said they’d never experienced such a long wait to enter the country, either. But, it’s something to be aware of when considering whether to drive or fly to the Osa Peninsula. Although I was late to pick up my rental car, the car was still there waiting for me. I wouldn’t have been as lucky if I had booked a flight. 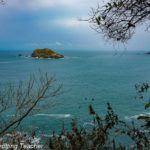 I also planned a stop in Manuel Antonio along the way for a couple nights. After being so delayed at the airport, this planning saved us from having to drive at night on roads with few or no lights. 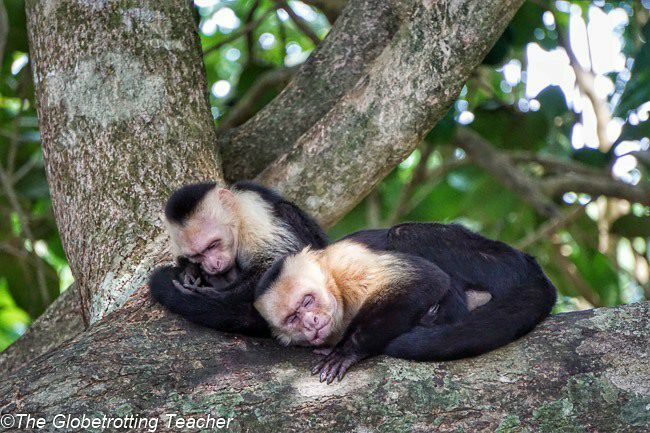 Plus, I got to spend a day with the naughty white-faced monkeys in Manuel Antonio National Park. Puerto Jimenez is the main town on the Osa. It sits along the Golfo Dulce, a sparkling protected inlet between the Osa Peninsula and mainland Costa Rica. Named “Sweet Gulf” for a reason, the Golfo Dulce looks and feels more lake than ocean. The calm, clear, sun-kissed water reflects the bright, blue sky overhead just like a piece of glass. Puerto Jimenez has just a few thousand residents and one dusty main road. But, travelers will find all basic amenities including ATMs, a supermarket, a gas station, restaurants, hotels, hostels, and the small airport. 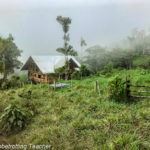 The town makes for a great base whether you’re doing the multi-day hike from Leona Ranger Station to Sirena Station in nearby Corcovado National Park or day-tripping throughout the area. The outdoor area of my room, complete with a hammock and lush greens. I love to hike, but I also love having a comfy bed at night where I can wash off the day’s sweat and dirt. My budget-friendly Puerto Jimenez hotel had basic bungalow-style rooms with pretty, lush grounds, a beyond helpful staff, and AC. The ability to cool off at day’s end should not be underestimated! 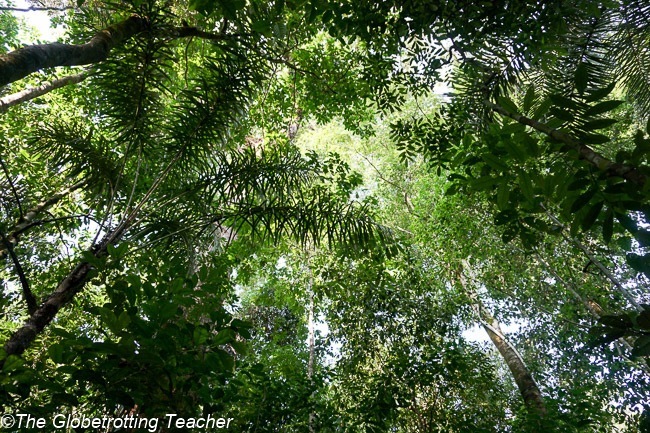 The Osa Peninsula is a tropical rainforest. The air is hot and saturated with moisture. The sweat is never-ending! 😉 For someone like me, though, with sun and heat intolerant skin, I needed to be sure my skin could regulate each night. If AC is important for you, don’t assume hotels or hostels have it. Be sure it’s listed as an amenity, as you’ll find many hotels (even beautiful luxury lodges) with just ceiling fans. Check latest Puerto Jimenez hotel prices. Visitors also choose to stay in Drake Bay and Matapalo. Drake Bay is on the northern tip of the Osa Peninsula, close to Cano Island and with boat access to Corcovado National Park. It’s more rustic than Puerto Jimenez and has no ATMs. Cash is king so be prepared and bring enough with you to pay for your Osa Peninsula lodging, food, and tours. Check latest Drake Bay hotel prices. The Matapalo area is about an hour from Puerto Jimenez along a very bumpy road. This laid-back area is near the southernmost tip of the Osa Peninsula and home to yoga retreats and luxury Osa Peninsula eco-lodges, like Lapa Rios. Matapalo is along the wild, rugged coastline and surrounded by primary and secondary rainforest. Wildlife sightings are a virtual guarantee. Humans not so much. Check latest Matapalo hotel prices. When I began to plan a trip to the Osa Peninsula, I went back and forth about the best areas to stay. 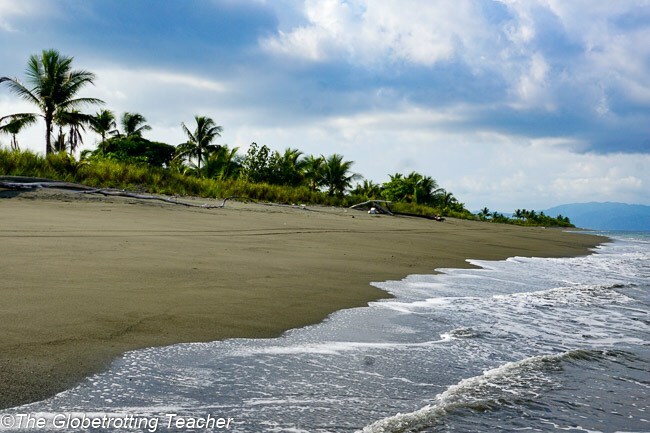 In hindsight, I’d absolutely still spend time in Puerto Jimenez because of its amenities, its nearness to the Golfo Dulce, and the relatively easy access to day trips and tours. Visitors without a car will also do well in Puerto Jimenez, as it’s easy to get around by bike, taxi, or on foot. However, I would tweak my itinerary a bit and also mix in a couple days stay in Matapalo, instead of just the day trip there. The easy access to self-guided hiking trails and the absolute beauty and isolation of the area made Matapalo irresistible. This was only confirmed by locals who recommended the area for my next trip to the Osa Peninsula. I’ve linked to an Osa Peninsula map to help you see the lay of the land as you plan. Undoubtedly, Corcovado is the gem of all of Costa Rica’s National Parks. 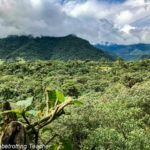 The 164 square miles of primary and secondary rainforests grow as green and dense as bunches of broccoli and only give way for a narrow stretch of untouched sand and turquoise ocean waters. The biodiversity in the park is everywhere you look, absolutely stunning, and has been noted as such by National Geographic. Expect to see an unbelievable array of Costa Rican wildlife. Corcovado is home to 4 species of monkeys, sloths, wild cats, tapirs, crocodiles, peccaries, anteaters, and the list would be endless if I named every mammal, bird, reptile, and insect. The National Park has a few different access points, none of which are all that easy to reach. You’ll have to work for your right to get to Corcovado! In fact, the only ways to get to one or more of the parks ranger stations is on foot, by chartered plane, or by boat. The latter 2 are, of course, pricier, but great options for nonhikers. Either way, you must have a guide to enter Corcovado. 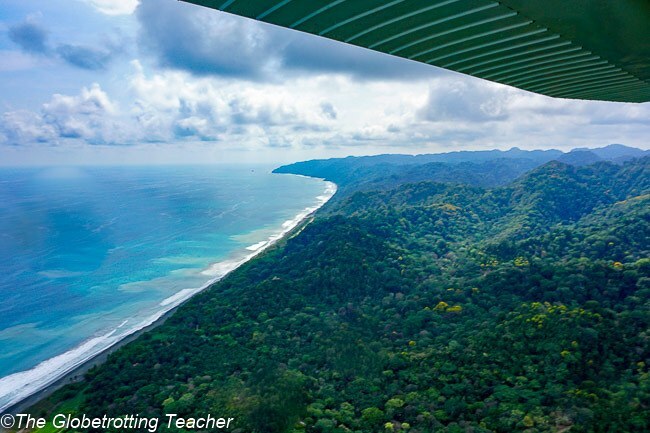 If there’s one can’t miss thing to do on the Osa, Corcovado National Park is it! 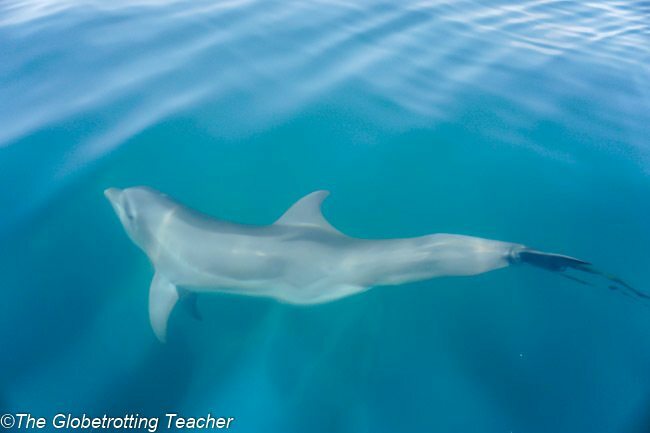 Watch Dolphins in the Golfo Dulce. The Golfo Dulce is fed by the Pacific Ocean and mangrove rivers and streams. This creates the perfect feeding grounds for dolphins who wait for mackerel and other small fish emptying into the gulf. 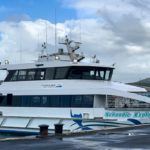 Day trip boats depart from the pier in Puerto Jimenez and cruise along the Golfo Dulce in search of the resident dolphins. If you’re lucky, you’ll see family groups swimming alongside your boat and playfully jumping out of the water! Migrating humpback whales also love the calm waters of the gulf and come to give birth and care for their babies between August-October. Explore the biological diversity underwater. Cano Island is the premiere spot to snorkel and scuba dive. The island is off the northern coast of the Osa Peninsula, closest to Drake Bay. Day trips from Puerto Jimenez are possible but require a very early morning start. You’ll be rewarded, though, with one of the most diverse underwater worlds in all of Costa Rica. The clear waters are home to dolphins, rays, all kinds of fish, eels, turtles, sharks, and whales. 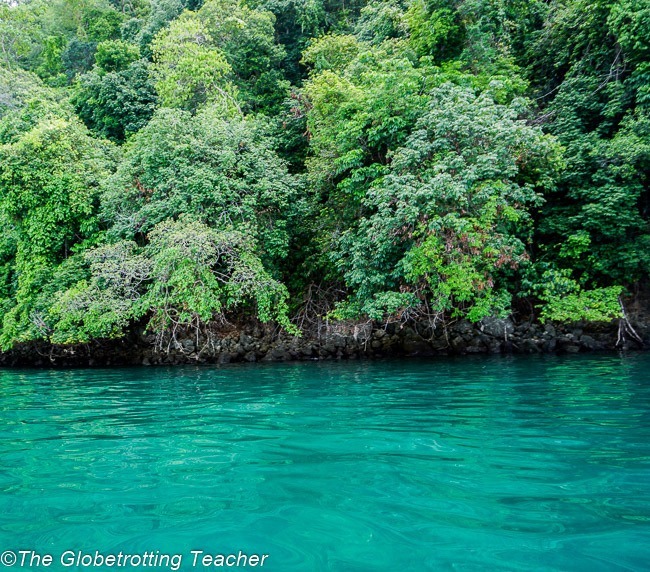 If you can’t get to Cano Island, snorkeling is also pretty good in the Golfo Dulce! I snorkeled in the gulf and saw lots of colorful fish, turtles, rays, eels, and more. Not to mention, it’s a lot easier to access from a Puerto Jimenez hotel. Spend the day in Matapalo. If you day-tripped to Corcovado and you’re still longing for more jungle time, hike the shorter self-guided trails in Matapalo near Bosque del Cabo. Spider monkeys are a common sighting as they move in troops through the forest canopy. 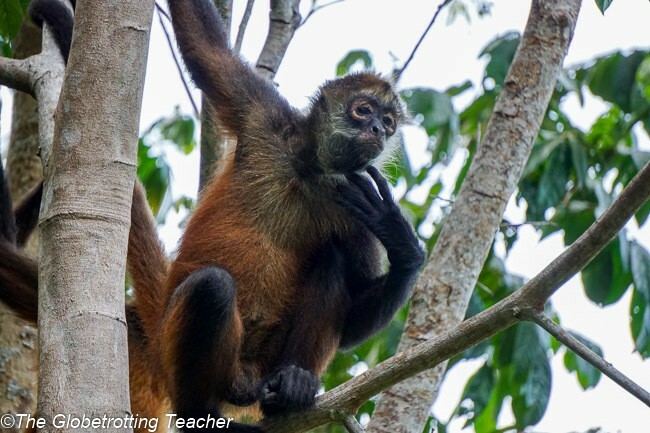 The deep-throated calls of the howler monkeys fill the air, disrupted only by pairs of loud squawking macaws flying overhead. The area’s eco-lodges also having offerings for non-guests. Make lunch reservations at Lapa Rios while taking in the breathtaking views of the rugged beach and turquoise ocean waters. Have more time? Book a guide to hike with you to the nearby rainforest waterfall. Maybe you’re someone who’d like to relax. In that case, call ahead to Encanta la Vida and check their yoga schedule. Non-guests are welcome to drop in for classes. 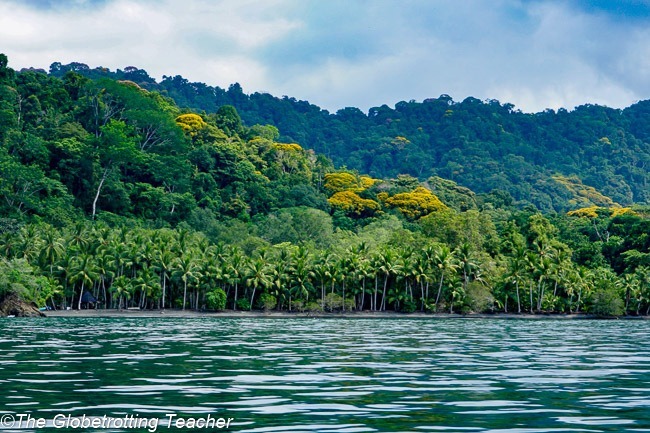 Kayak through mangroves and into the Golfo Dulce. 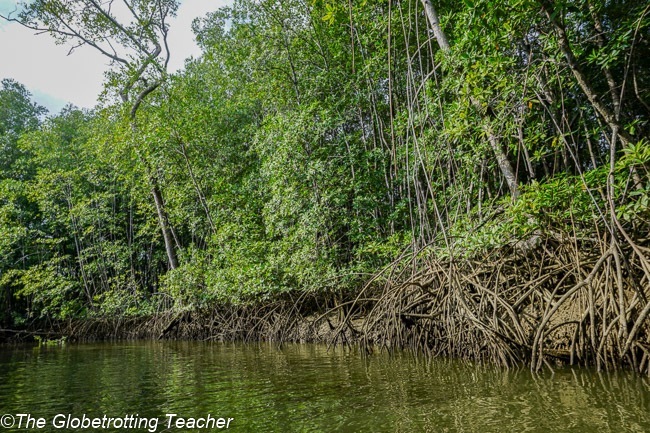 The mangroves on the Osa Peninsula are a tangle of tree roots and twisted vines. The shallow, grassy water offers baby fish some protection from the wilds of the larger gulf and ocean. Expect to see water birds, like heron, always searching for these fish as their next meal! Kayaking in the afternoon is not complete without a stop at a deserted beach to enjoy juicy pineapple and the absolute peace of being on your own. 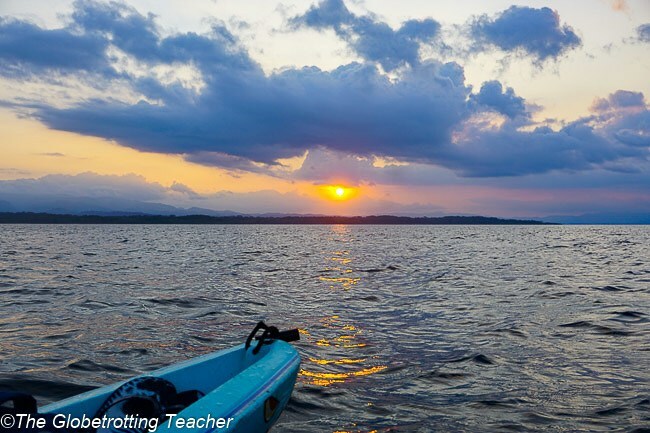 When you’re ready, kayak back to Puerto Jimenez’s beach area and watch the sky turn all shades of pink and orange as it sets into the horizon. Whether you’re hiking or just out for the day, a daypack is essential for carrying water, sunscreen, bug spray, and other essentials. The Osa Peninsula weather is sunny and humid. Hydration is a must! Carry water at all times. Be mindful of your camera and other electronics when they move between warm and cool temperatures, say from outside to a hotel room with AC. Lenses fog and condensation forms quickly. Use plastic bags or a dry bag to protect against moisture. 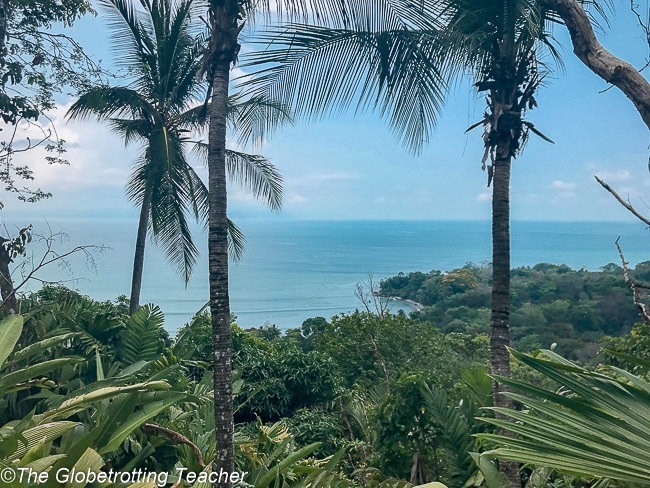 When hiking in Corcovado, wear a pair of sturdy hiking boots, moisture-wicking hiking pants, and white socks that go up your shin to protect against ticks. If you’re really off-the-beaten path, consider rubber boots like the guides wear. 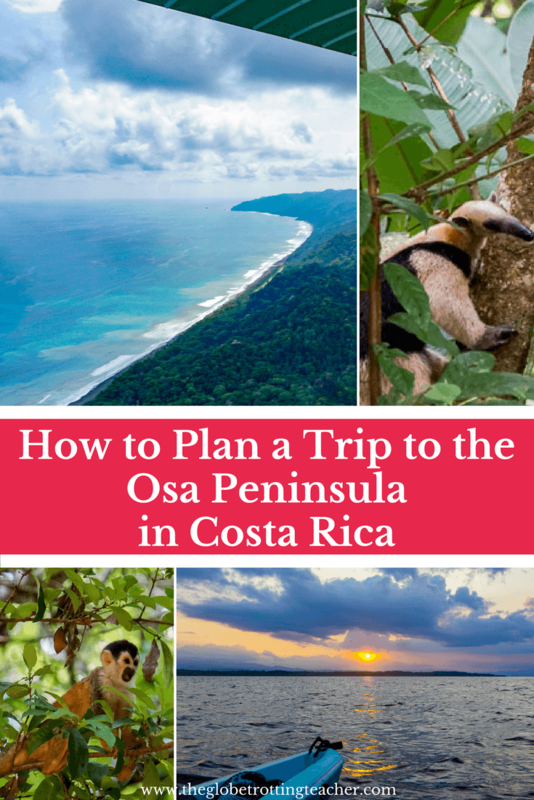 So, would you like to plan a trip to the Osa Peninsula in Costa Rica? I want to go to Costa Rica to not only enjoy the beautiful beaches but all the biodiversity there! I am most intrigued with the monkeys, there’s something I love about monkeys despite the fact they can be ornery and little thieves! I also love the view from Matapalo! 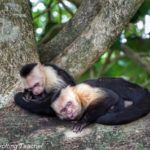 Beautiful beaches and biodiversity abounds in Costa Rica, Megan, as do the monkeys. 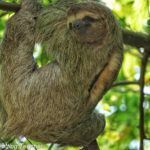 If you want to see all 4 species in Costa Rica, you’ll need to head south to the Osa. You can check them off your list while hiking in Matapalo! We just got back from a trip to Costa Rica and I wish I would had read this post before! 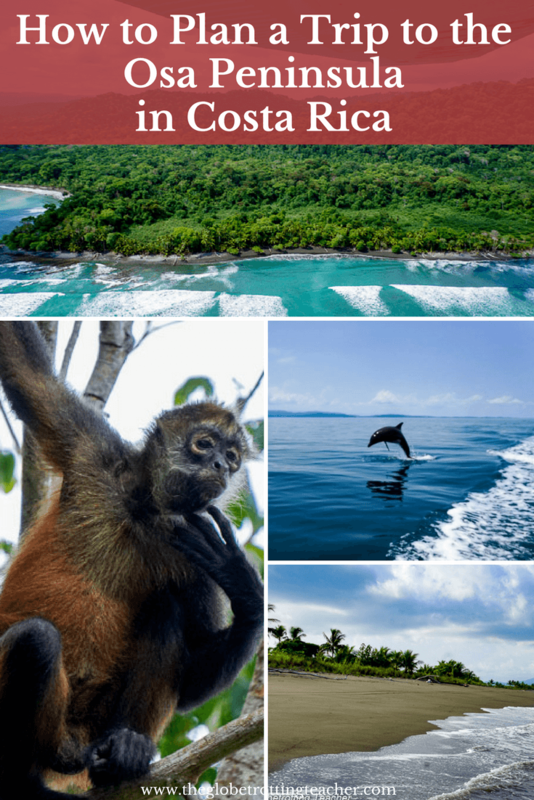 I am totally in for Corcovado National park and dolphin watching! Oh Costa Rica. I’ve never been but keep hearing about it left and right, almost as if it were the Chiang Mai of Central America. So beautiful. 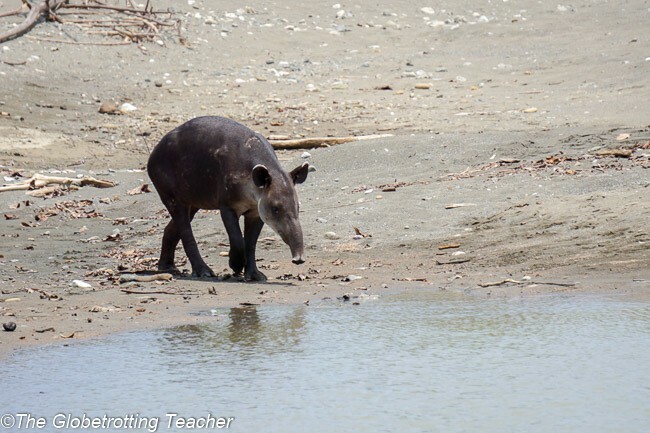 Would I like to plan a trip to the Osa Peninsula? Absolutely! I regret not getting there during our last trip to Costa Rica. Your nature an wildlife photos are spectacular. It does appear that you practically had the place to yourself, a rare occurrence in Costa. Hiking in Corcovado National Park and diving off of Cano Island would top my must-do activities. Thanks for putting the Osa Peninsula on my travel radar, hoping to make it out there sometime. I’ve never heard of the Osa peninsula before. I haven’t travelled extensively in Latin America but my daughter went to Argentina for a student exchange last year and we hope to travel around Latin America near the end of this year. I’ll definitely be bookmarking this page for when we start our planning. It looks absolutely gorgeous. Just gorgeous! Unfortunate to hear about the airport situation- I just flew in and out of Saint Lucia and it was a total gong show. So annoying to have a long flight and then an hours-long wait in a stuff customs line just to get a stamp! The Osa Peninsula looks so amazing! I was supposed to head there a couple of years ago, but unfortunately the plans fell through. Really hope we can make it sometime soon–love the photos you captured! 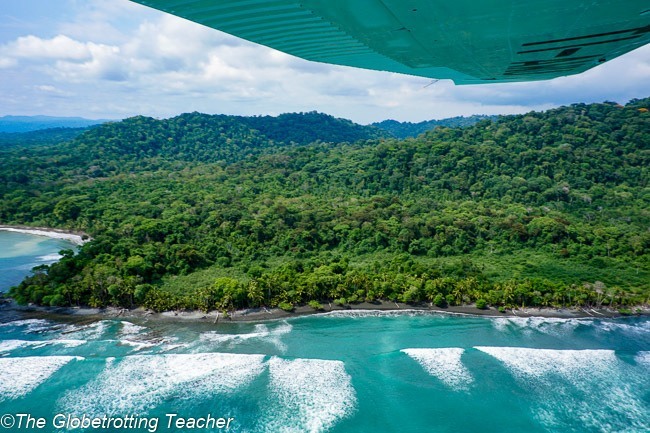 Corcovado National Park, kayaking, the beaches…everything looks so wonderful! Oh, I hope you can plan another trip, Jenna! I had that happen with Cuba and it stinks when a trip doesn’t work out. 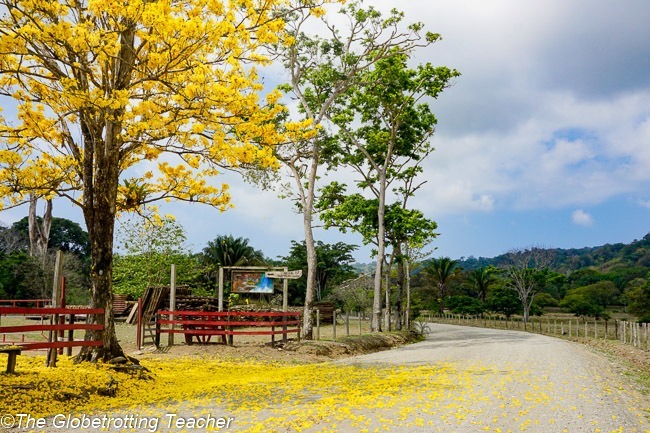 The Osa is spectacular and I’m sure you’ll love it when you finally get there! Hi Jackie, I am a half time digital nomad. I usually head for winter to South Asia. Lately I have heard many nomad talking well about Costa Rica. How is it to leave there? I looks fantastic, especially this Osa Peninsula. looks very natural and untouched. Many thanks Jackie, I will keep doing my research. What is your next destination? Great article. Can you provide guidance on the tours? We’re staying in drake bay and would like to visit cano and the corvacado. Should we schedule these trips in advance or can we take care of that the day before when we’re in town? How should this be handled? Thanks for your response! Quick follow up. What time of year did you go? We are heading down in April. We’ve heard about quotas on entry to Cano and other parks. No problem, we went in the 3rd week of April last year. I don’t know of any quotas, but we didn’t have any trouble whatsoever. Hopefully, that’s your experience, too. 🙂 Enjoy the Osa. I loved it there. Can you recommend a way to get self guided hiking maps for Matapalo. Myself and family (9 in total) are on our way there next month. Staying in a house so we would like to maps for hiking trails ready to go. Hi Heidi, thanks so much for reading! The Osa is spectacular! Lucky you and your family. It’s a bit tricky to find/share a map of the self-guided hiking trails in Matapalo because the hotels and guides in the area would rather visitors sign-up for excursions. Bosque del Cabo is widely known to have several self-guided hiking trails, but there are mixed reports about whether or not they’re open to non-guests using them. I tried while I was there, even offering to purchase lunch at the restaurant (unfortunately it was closed that day). However, others have done just that and had no problem. What I will say is some of the trails have access points from the road and even the long dirt driveway leading to Bosque del Cabo’s reception area, which was what I did to hike in the area. They have this map and other hiking information on their website. I’d also ask your contact for your house rental and even consider a similar scenario at other lodges and hotels in the area. I did have lunch at Lapa Rios and was able to explore the grounds/trails on their property. Hope this helps and you have an amazing trip!! Is it possible to do a day hike only in Corvcado Park? Where would we start, and how do we get a guide? Thanks a lot for all the information! We are planning to be in Costa Rica on October and spend some time in Oso. Is the visit to Corcovado N.P. is doable for a 3 Yrs. old? The boat ride, some hiking etc? Would it be to difficult? Thanks so much for reading, Ygal. The Osa is fantastic and Corcovado is beyond amazing. I think the boat ride would be ok for a child, but I might check with whoever your guide would potentially be about an age minimum. While most of the trails for a day tour are easy to moderate, I would be more concerned about the animals and the heat. They are everywhere and there could be times when it’s necessary to be absolutely silent. The humidity is thick so drinking water is a must and there’s only a bathroom at the main ranger station. On the other hand, Corcovado is a can’t miss so perhaps a private tour might be better than a group?? If it doesn’t work out, stay and/or hike in the Matapalo area. The trails are in the same forests as Corcovado and animals can be sighted there as well. Good Luck and I hope you have a great trip! Thank you Jackie for the information! My concerned is more about the length of the trip to the N.P. young kid a whole day trip in the park is not so easy, a half a day would be much easier. Also, are all the guides taking you to the same trails? You’re welcome! So, most tours are a full day between getting to the park and then spending time there and getting back to Puerto Jimenez or Drake’s Bay. 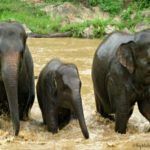 That’s why a private guide might be worth the money if your budget allows. You can decide your timing. I wouldn’t say all the guides take the same trails. It’s more about looking for animals so it’s not a straightforward hike but rather the guide looking for/listening for signs of animals nearby. We zigzagged all over from the dense jungle to the ocean shoreline. If you’re in Puerto Jimenez, another thing to consider is the private plane to the park. It’s the most expensive option, but you are back and forth between the park quickly and the guide is just for you and your family, giving you the freedom to stop, take breaks, etc. without the bigger group. Do you have any recommendation where to stay in Cabo Matapalo? Also, how many days/nights are needed to visit this area? We will travel there on mid-October, 2 adults and a kid. My husband and I are researching our Costa Rica trip in January. I am already in love with Osa, and would pretty much want to spend my entire trip there. However, to keep everyone happy, we need a split between this and other activities, like volcanoes and the cloud forest. We have 13 days (excl. getting in and out of San Jose). How long do you recommend staying in Osa to get to see the main attractions and get a bit of chill time on the beach? Thanks for reading, Alex. The Osa is every bit as incredible as it looks. I’d recommend spending half your time, if not a day or so extra, on the Osa. Without knowing which activities, hikes, etc you want to do there, consider that the area is quite rugged and the driving travel time from where you’re staying to Corcovado, Matapalo, Cano Island, etc takes time. Places are remote and you may even want to split your stay between Puerto Jimenez, Drake Bay, and Matapalo depending on your plans there. P.S. 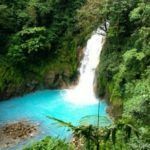 If you’re up near Arenal and points north, the Rio Celeste hike and waterfall are spectacular! I also love Osa Peninsula but it’s been 15 years since I have been there. I originally took a bus from San Jose to Drake Bay and caugt a small boat to our lodging just outside of Corcovado NP. Now I would love to bring back my husband and 2 daughters (8 and 11). I read your blog and saw you had some great advice. I was looking into staying at the Jaguar Jungle hostel. Are you familiar with this accommodation? Thanks for reading, Kim. I’m not familiar with Jaguar Jungle Hostel, but I looked it up and the location looks amazing! You might miss this experience of being consistently that close to Corcovado and its wildlife when you stay solely in Puerto Jimenez. 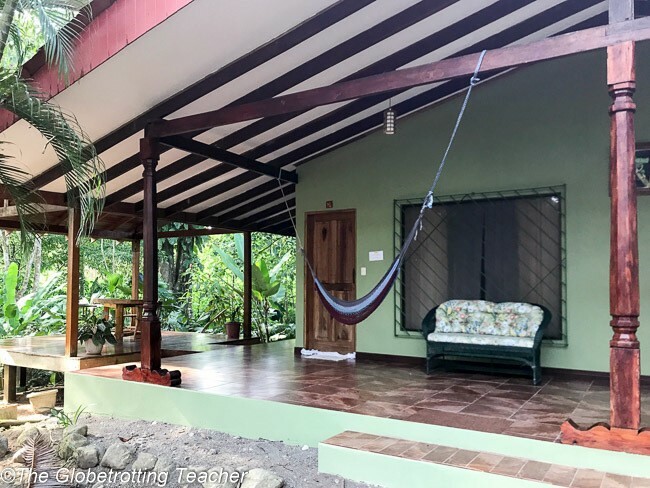 On the flipside, though, the location is very remote, making it hard to get to other places like if you wanted to snorkel at Cano Island or enjoy any of the activities/amenities available in Puerto Jimenez. It all depends on what’s most important for your trip. If I had to do it over again, I’d definitely divide my time on the Drake Bay (Jaguar Jungle Hostel) side and the Puerto Jimenez/Matapalo side to make it easier to get to and do specific things on the peninsula. Enjoy your return to the Osa! It’s spectacular. I’ll be in CR from 3/1 to 3/6 and want to spend as much time on the Osa as possible. Because my inbound flight from San Salvador arrives after the last Sansa flight from SJO-Drake Bay leaves, I was intrigued about the possibility of renting a car for the trip down to Corcovado, then flying back early morning of 3/6 (I’d rather drive down to Manuel Antonio and stay there the night of 3/1 than wait a whole day and get an early morning southbound flight on 3/2). What rental company did you use, and where did you drop your car off near Corcovado? Also, how was the drive down via the coast? Do you feel comfortable recommending driving in CR?